One of the things I love most about Vancouver is how walkable the city is. The other thing I love is its abundance of parks and outdoor spaces, and this snapshot of one of our days in Vancouver combines the best of both. You can follow this route on foot, bike or a combination of both, and are guaranteed to get a good sampling of what the city has to offer. When we were planning our trip to Vancouver, the activity on the top of my list of things to do was bike the Seawall at Stanley Park. 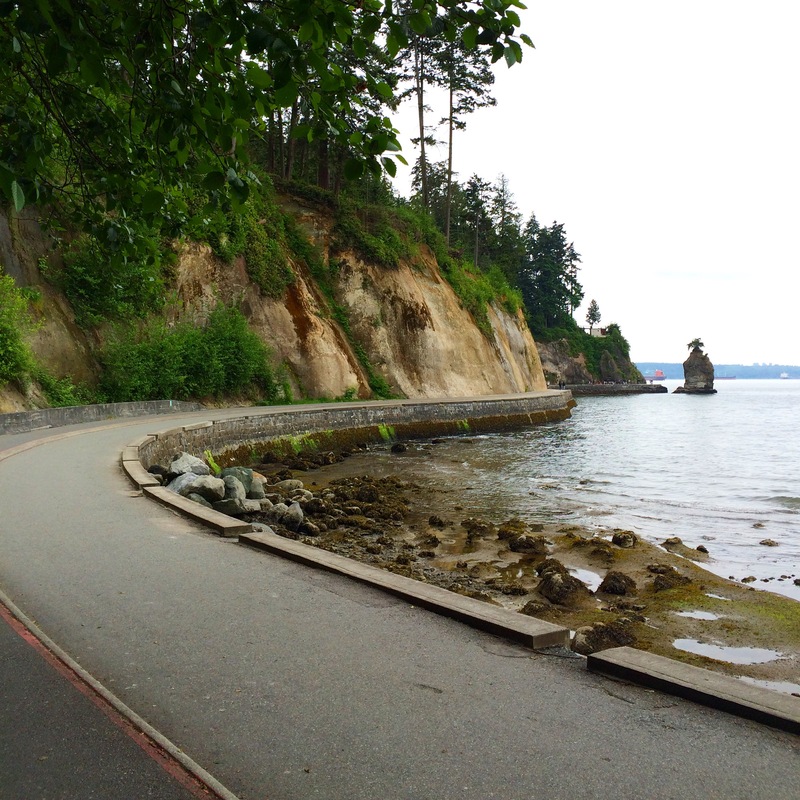 The Seawall was originally built to prevent erosion around the 1,000-acre public park, and now provides a paved 5.5-mile (9 kilometer) loop for bikers, runners and even those on roller blades. Determined to improve my shaky bike riding skills from lack of practice (I’m lucky if I bike once a year), we rented bicycles at English Bay Bike Rentals on Davie Street. Located a few blocks from Stanley Park, the shop has several options of bikes to choose from, and all rentals include helmets (it’s mandatory to wear them by law in Vancouver) and any other add-ons you might need like locks, bags, etc. Once we were set up, we hit the road and made our way to Stanley Park. On wheels you’ll go counterclockwise around the Seawall path (on foot you can go either direction), which typically takes bikers about an hour to make the full loop. It was a little longer for us since we stopped a handful of times to take in all of the sights. With forested cliffs towering above us on the left and the water of the Vancouver Harbor and English Bay on the right, we could have easily played an elaborate game of “I Spy” – there really is that much, from boats and birds to totem poles to a light house, the list goes on and on. You can read more about some of my favorite things to see and do in Stanley Park here. 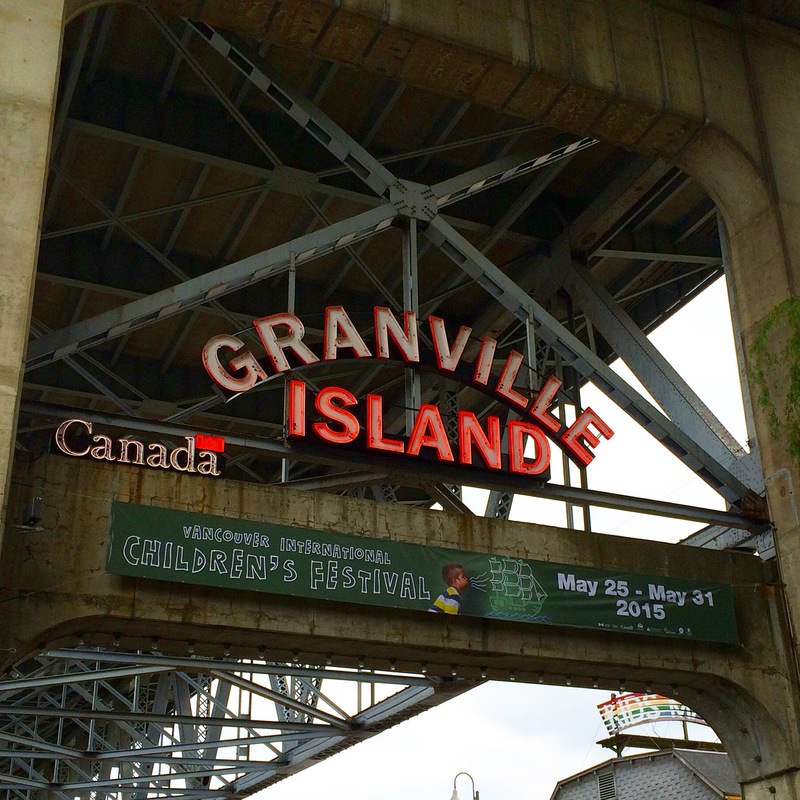 After making the full loop around the Seawall, we returned our bikes and headed to our next destination on foot, Granville Island. 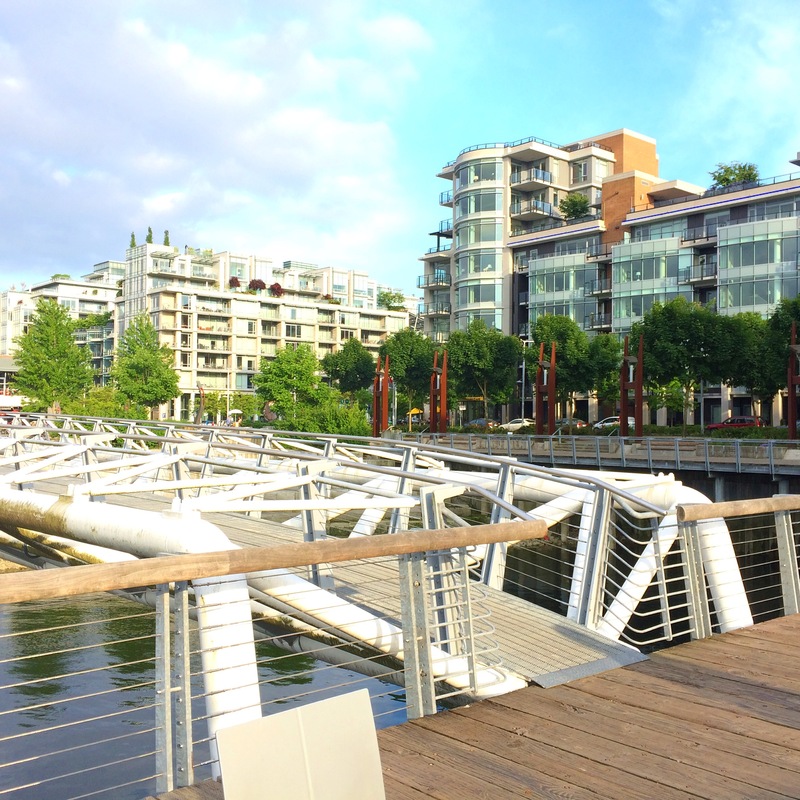 Located across False Creek from Downtown, it’s a 30 or so minute walk via the Granville Street Bridge (when you get to the south end, veer right onto 4th Avenue and then backtrack under the bridge), or a quick ferry ride from several points around the city. Fun fact, Vancouver was originally known as Granville until it was renamed in 1886, but the name stuck for the street, bridge and eventually the island below. Granville Island has a laid back industrial vibe, echoing its roots as a former manufacturing area, and is now home to a diverse mixture of restaurants, cafes, shops, theatres, art galleries, a brewery and the oh-so-marvelous Public Market. All of the commotion you would expect to find at a market, combined with the sheer variety of options was a feast for the eyes, or an appetizer for a hungry person’s stomach. We carefully surveyed all of the stalls and then backtracked to assemble our eclectic lunch: an overflowing carton of fresh fruit, prawns and chips and masala chickpeas and naan bread, which we devoured at a table upstairs overlooking the crowd below. Afterwards we treated ourselves to a heaping cup of gelato (justified by the morning’s bike ride, naturally) and spent some time browsing Granville Island’s boutique shops before moving on. Next we continued down Island Park Way, a paved path that runs along the south side of False Creek. It’s a picturesque and relaxing walk along the waterfront, lined with docked boats, green parks and glass skyscrapers. One of the highlights on this side of town is the 130-acre Queen Elizabeth Park (we took the SkyTrain’s Canada Line from the Olympic Village stop to the King Edward stop to save some time), which was once an excavation site for the rock used to build Vancouver’s first roads. The sunken quarries were later transformed into the gorgeously landscaped park you see today, dedicated during the 1939 visit of King George VI and Queen Elizabeth. This oasis kind of took us by surprise with so many beautiful flowers, trees and plants (many with leaves bigger than your head), not to mention waterfalls, bridges and the Bloedel Conservatory. It’s also the highest point in Vancouver, offering amazing views of the park below, city skyline and Grouse Mountains in the distance. After exploring the park, we hopped back on the SkyTrain and walked towards the former Olympic Village on the southeast edge of False Creek. This area was developed for the 2010 Winter Olympics, and the buildings that once housed athletes and officials from around the world has since been turned into a vibrant mixed-use community. Some worthwhile sights nearby include Hinge Park, a rainwater wetland that can be described as part park and part science experiment, and the CRAFT Beer Market on Olympic Village Square. From here we continued around the creek, passing the Epcot-like Science World at TELUS World of Science and the BC Place Stadium, which was most recently played host to the 2015 FIFA Women’s World Cup. 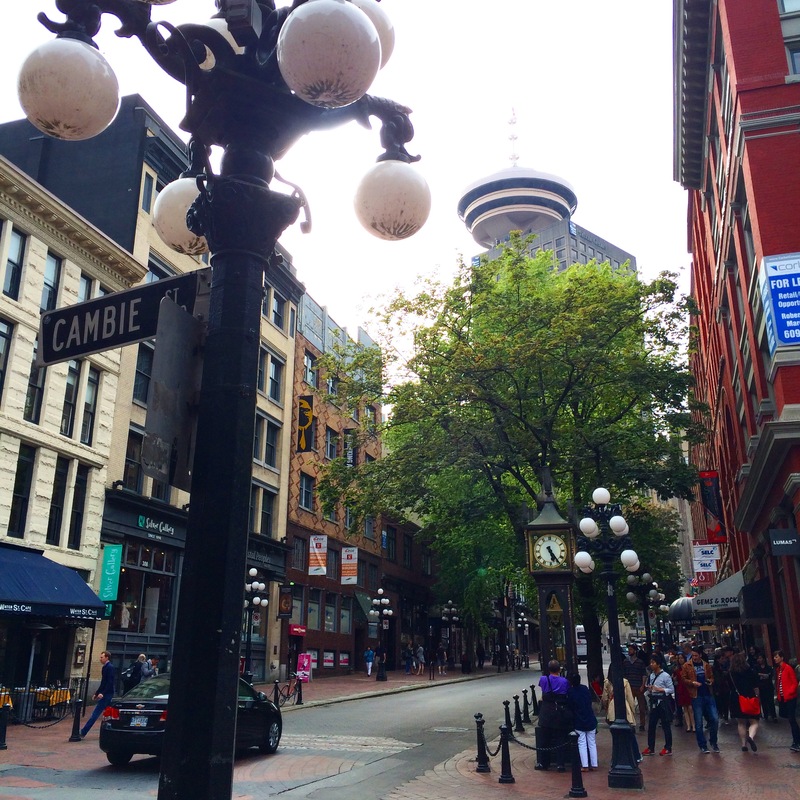 Back in Downtown, our last stop for the day was Vancouver’s Gastown District. This neighborhood was named after steamboat captain “Gassy” Jack Deighton who opened the first saloon here is 1867, and today balances historic charm with a cool independent vibe. Among its cobbled streets, old lamp posts and the steam-powered clock on the corner of Cambie and Walter Street, you’ll find an eclectic collection of fashion and design boutiques, art galleries, restaurants and bars. Some of my favorite places were John Fluevog Shoes (purveyor of some pretty awesome handmade shoes – this is the brand’s flagship store) and Parliament (an uncommon home furnishings and décor shop), as well as Nicli Antica Pizzaria for authentic Neopolitian pizza (we came back the next day for dinner). So if window shopping is not your thing, you’ll have no problem finding a place to kick back and unwind after a day of exploring the city.